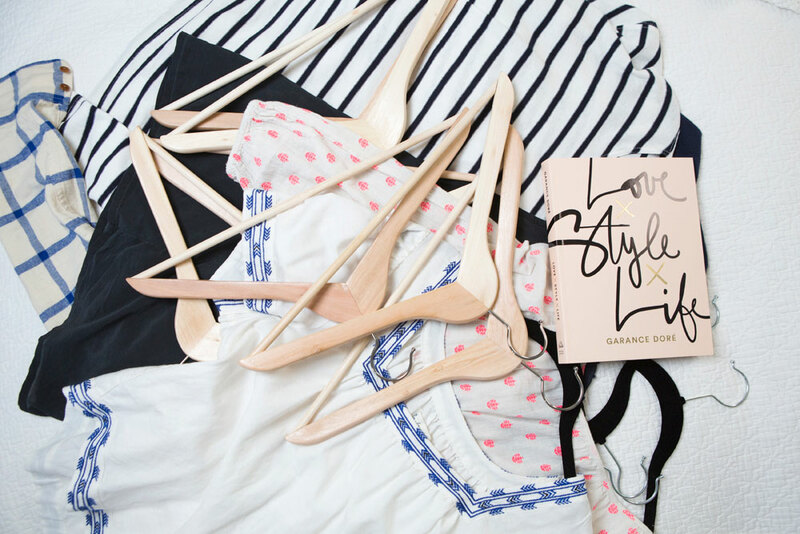 Start by removing everything from your closet. You heard me. Everything. Every. Single. Thing. I generally use a bed for a staging area, or place an old sheet on the floor so it’s easy to lay everything out in preparation for editing and sorting. 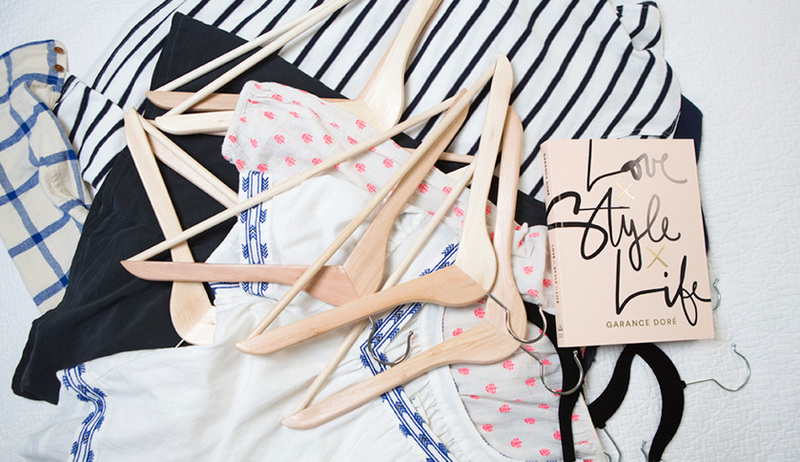 It helps to organize clothing in stacks by specific categories so you can take inventory. This will make it easy to see how much you have of each type and will also expedite the editing stage. This is your opportunity to start fresh, so make sure to wipe down any shelving, give the space a vacuum and relocate stray items that don’t belong in your closet. Does this item reflect my authentic personal style? Is this item really worth the space it’s taking up in my closet? Does this item energize or drain me? Uniform, streamlined hangers. Same style and color for a consistent look. Open bins and baskets for storing accessories. Shelf dividers to keep stacks of folded jeans or sweaters from toppling over. 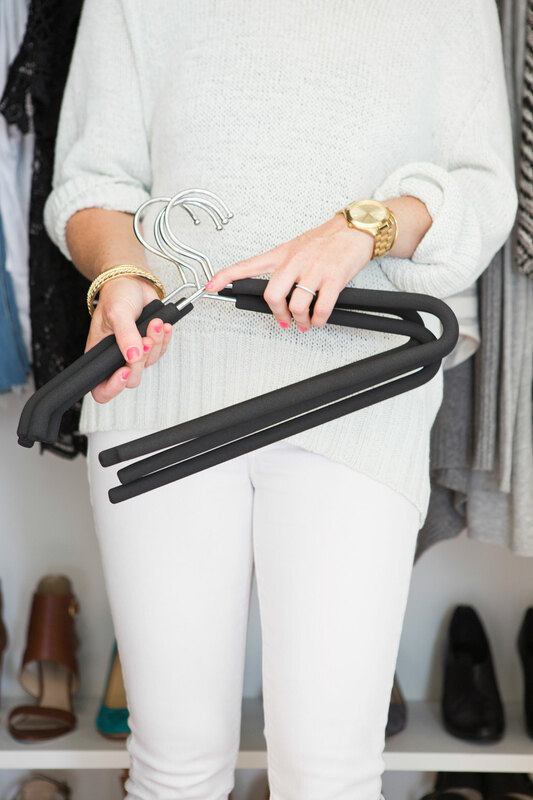 Sturdy hooks for bathrobes, handbags and necklaces. In deciding where to store things, consider how frequently you use them. 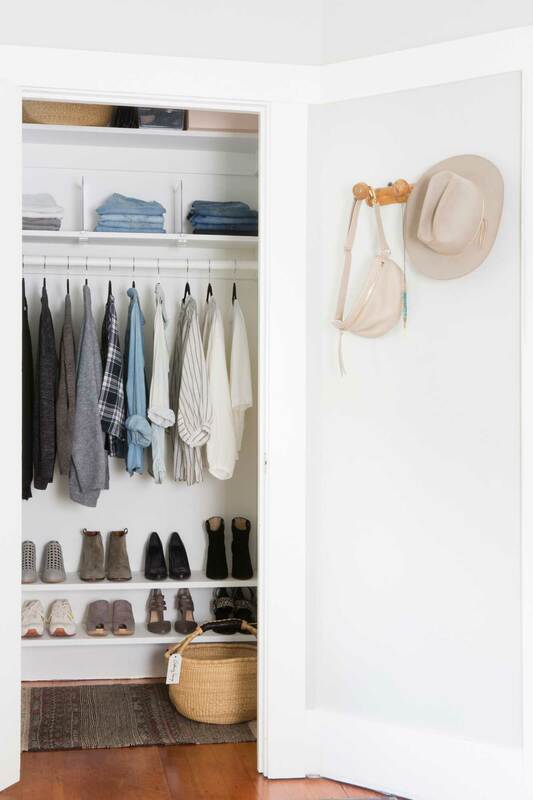 Try to keep everyday essentials visible for easy access, and formal, seasonal, and occasional items in the back of the closet or on a high shelf. 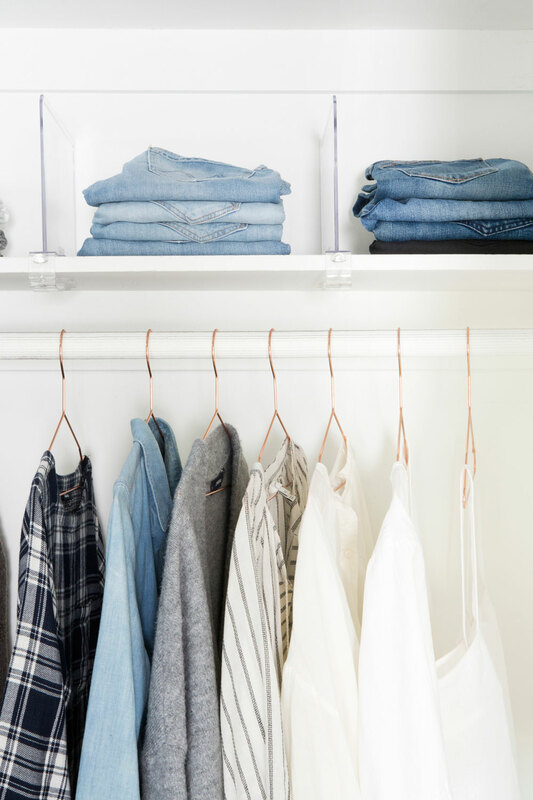 Create a stylish, organized look in clothing closets by using uniform hangers (no more wire hangers!) and arranging hanging items by type, style, and color. Use pretty bins or baskets to store gloves, scarves and accessories. 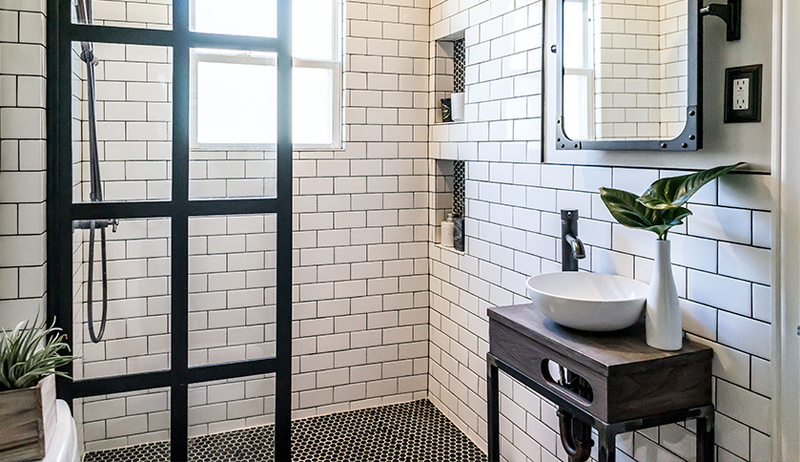 Pick one style and color of bin to keep everything looking clean and streamlined. 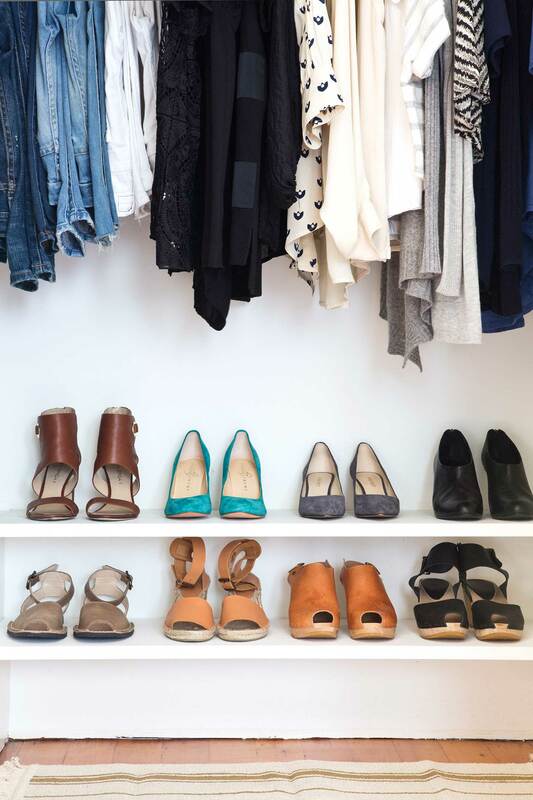 Display shoes on open shelving, shoe racks, or cubbies so you can see what you’ve got. Formal or occasional shoes can be stored and stacked in clear shoeboxes. 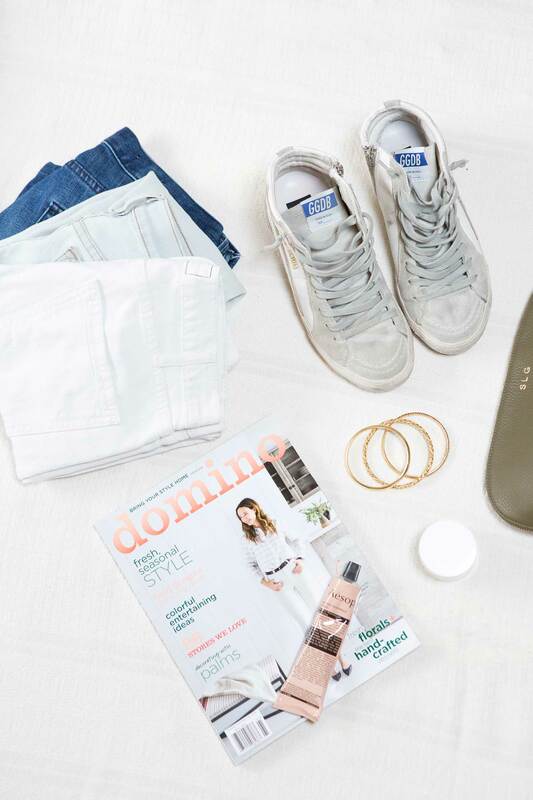 Flip-flops, sandals and sneakers work well in a round basket on the floor for easy access. Handbags can be hung on sturdy hooks and clutches, and small accessories can be stored in labeled bins or baskets. Once you’re all set up, it’s nice to add some personal touches and décor to complete the look. You might try fun patterned wallpaper, a throw rug, pretty lighting, framed pictures or an inspiration board. 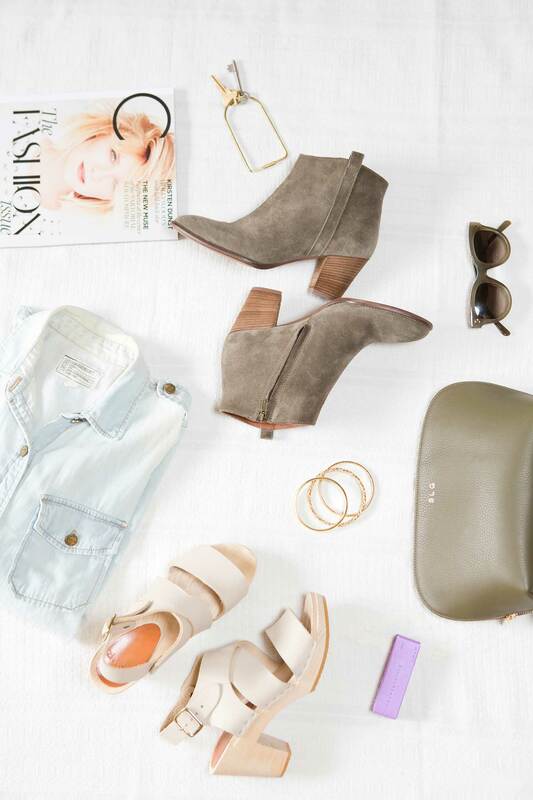 Life can get messy, but your closet doesn’t have to. Inevitably, you will buy new things and receive gifts. In order to maintain a streamlined and stylish closet you must respect the boundaries you have set up. Every time a new item enters your closet, a similar item should be donated or taken to a buy-sell-trade or consignment store. (When deciding whether to sell or donate your unwanted items, consider if the time it takes to consign or list on Ebay is really worth the dollar amount you may earn, usually a small fraction of the original price.) It’s also helpful to keep a basket or tote bag in your closet for storing donations as they arise. When the bag is full, toss it in your trunk and drop off those donations! For information, and free free worksheets and resources, please visit: www.shiragill.com. Follow Shira on Instagram @shiragill for weekly tips and inspiration. So sad that the print is so light. Really strained trying to follow this. Since there is a lot to follow, those of us with not the best eye site. Sorry couldn’t continue. Just thought you may want to know.